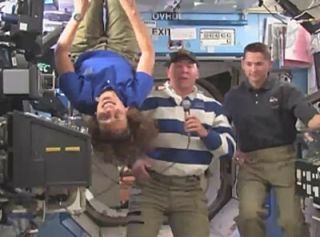 Discovery space shuttle commander Alan Poindexter (center), mission specialist Dottie Metcalf-Lindenburger (left) and pilot Jim Dutton answer questions from students on Earth during a video session on April 10, 2010 during the STS-131 mission to the International Space Station. Space junk littered around Earth poses an ever-presentthreat to astronauts in orbit, but the crew of NASA?s space shuttle Discoverysaid the danger, to them, is mostly an invisible one. Discovery commander Alan Poindexter told students onEarth Saturday that the spacedebris whizzing around Earth is mostly imperceptible to the unaided eye ofastronauts working in orbit. The astronauts are at the International SpaceStation to deliver tons of new supplies and equipment to the orbiting lab. ?We don?t really see any spacejunk,? Poindexter said. ?Anything we see floating outside usually comesfrom the shuttle.? Every now and then, astronauts dump wastewater overboardthrough a nozzle on the side of their space shuttle, Poindexter said. ?It looks like a snowstorm because it instantly turns toice,? he said. ?It looks beautiful when the light hits the ice particles.? But just because the astronauts can?t see the space junk,doesn?t mean no one is watching. ?There are a lot of people on the ground who are watchingthat very closely ,and they?ll let us know if we have to move the shuttle orstation out of the way,? Poindexter said. NASA typically moves the space station if there is a1-in-10,000 chance of an object striking the $100 billion orbiting laboratory.So far, Mission Control has seen no signs of any bits of trash near the stationand Discovery. NASA and the Department of Defense's Space SurveillanceNetwork routinely monitor the space debris environment for potential impactrisks for satellites, spacecraft and astronauts in orbit. An unprecedented crashof two satellites last year increased that impact risk, about a 1-in-300chance for the space station, for all spacecraft. At last estimate, there are than 20,000 pieces of spacetrash in orbit, according to the Space Surveillance Network. There are 13 astronauts living and working aboard thelinked shuttle and space station. They spent Saturday hauling cargo out of atransport module deliveredto the space station by Discovery and speaking with reporters on Earthabout the spaceflight. A false smoke alarm, caused by dust while an astronautwas cleaning an air filter, interrupted their work briefly. The astronauts are gearing up for their mission?s secondspacewalk, scheduled for early Sunday. Discovery?s STS-131 mission is one of NASA?s last fewplanned shuttle flights before the space shuttle fleet retires in September. Afterthis mission, only three more shuttle flights will be left. Poindexter said he hopes to not see any space debriswarnings during Discovery?s 14-day spaceflight. Space station flight director Ron Spencer told reportersthat there hasn?t been anything on the radar to worry about yet. ?So far, the skies have been clear,? he said.